Faraway Pillow: Markets Around the World... You Like, You Buy! ‘Hey, Lady… you like, you buy!’ shouts a zealous marketer in Bangkok’s busy Patpong night market. It’s 11pm and an endless sea of stalls offer an assortment of wares ranging from fresh produce to dodgy knock offs, souvenirs trinkets, traditional handicrafts, used batteries and individual tissues for sale. It’s a one stop shop; purchase a unique souvenir, oddity or toiletry while loading up with the most colorful, obscene, unbelievable stories to tell when you get home. Patpong is an entertainment district, the Red Light District of Bangkok, that largely caters to tourists and expatriates.The market is only a portion of the four acres that are also home to one hundred back-to-back bars, mostly that cater to men. Love it or hate it…few will ever forget their time in Patpong, a.k.a the 'Den of Sleaze'. ‘How much is this?’ I ask. The vendor doesn’t understand English so I try the question in my repertoire of languages. French, ‘Combien ça coûte?’ gets a reaction and she replies by typing on a calculator, 300. After several drinks imbibed during dinner, I’m uninhibited and I immediately counteroffer 100 Baht. Prices are inflated from the start and buyers are encouraged to haggle hard to get fair prices. In fact, buyers should generally pay 50% of the asking price. The vendor woman physically stops me from walking away and types 150 into her calculator, displaying the figure, in a brash and expectant flurry. I agree to the price which converts to around $5 USD. Minutes later, my husband is still laughing at me. ‘What is so funny?’ I ask. I finally understand the irony of what had transpired. I am a tipsy American, in a very seedy night market in Bangkok, bargaining in French for a DVD copy of The Passion of the Christ, which I later came to discover was pirated. In the shadow of a flashing neon light, advertising Go-Go girls and ‘talent shows’, I decide I’ve had enough and hail a taxi back to the land of the righteous. It’s good to be back. While Patpong Night Market is an exceptional example of a notoriously sordid, amusing, far-fetched fantasy of what is possible; most markets offer a much more traditional, G-rated experience. 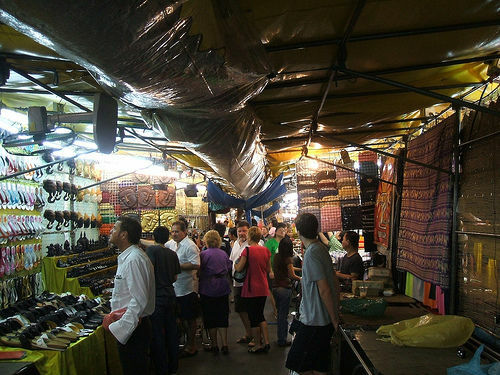 Five of my many favorite markets around the world are; the Pisac Market in Peru, the San Telmo Antique Market in Buenos Aires, the Grand Bazaar in Istanbul, the floating markets of Thailand, and the San Lorenzo Market in Florence. Pisac Market- Pisac, Peru: This quiet town in the Sacred Valley of Peru hosts a famed artisan and antique market every Sunday from 9am to mid-afternoon. Hundreds of stalls crowd the central square marked by a small church- San Pedro el Apóstolo, and massive pisonay trees. Sellers come from many different villages, many of them from remote populations high in the Andes, and wear the dress typical of their village. Goods for sale include sweaters, ponchos, tapestries, rugs, carved gourds, musical instruments, etc. Alpacas roam the ancient streets of this quiet town and on market days owners kindly offer photos for a tip. A little girl rushes to my side, wearing tattered traditional clothing, and exudes the pride of an Incan princess as she hands me her baby alpaca, a prized possession, and likely a friend. The tiny animal is white, warm, soft and adorable beyond words. The little girl’s eyes never leave her adored pet and as soon as the photo is snapped she collects and snuggles it in a pouch across her chest. It’s a tender sight and shows me how in many ways the Alpaca provides sustenance for the spirit of the Andean people. Feria de San Telmo- Buenos Aires, Argentina: The San Telmo neighborhood of Buenos Aires is known for its funky Bohemian vibe, tango and timelessness. It’s a fun area to visit any day of the week but San Telmo truly shines on Sundays. Centered around the Antiques Fair in Plaza Dorrego and stretching down the cobbled Calle Defensa, the Sunday market leaves shoppers and people-watchers awestruck! Artists, musicians and vendors come from near and far to share their talents and trades with the world. We shade ourselves under a giant tree over the Plaza Dorrego and snoop around a stall selling postcards from the 1920s, a colorful collection of old glass bottles, antique baubles, and lace lovelies. If only these items could talk and tell of the lives they’ve been a part of over the decades, maybe even centuries. Was this necklace worn to a lavish party perhaps in the late 19th or early 20th century, during the zenith of Argentinean Prosperity? Did this wine bottle contain a welcome reprise from the harsh economic crash in 1999? As I ponder the past, I look toward the plaza and see an impromptu tango dance between an old man in a pinstriped smoking jacket and glamorous woman in a slitted evening gown. I watch them dance the sultry, melancholic dance as people have done here for ages. History lives. 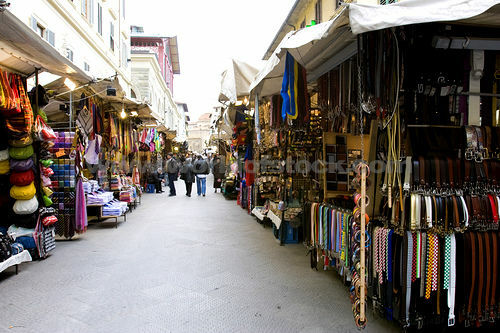 The Grand Bazaar- Istanbul, Turkey: The Grand Bazaar is one of the largest and oldest covered markets in the world. Situated over 58 covered streets and 31,000 square meters, about 250,000 visitors come each day to buy everything from jewelry, Turkish carpets, leather, glazed pottery, spices, and much, much more! The Grand Bazaar is a small town in itself, with miles of passageways, restaurants, mosques, banks, police stations, and 4,000 shops. We’re tired and lost. We’ve loitered the aisles and alleys of this giant market for hours browsing the conglomeration of wares but I can’t leave without sumac! I smell its aroma and let my nose guide me across the maze of this ancient trading center. Its astringent lemony flavor is like nothing I’ve tried before. It's very popular in the Middle East and is sprinkled liberally on salads, rice, meat, etc. Finally, I come to a stall selling every imaginable spice- paradise for those, like me, who believe, ‘spice is the spice of life’. Floating Markets of Thailand: Several floating markets around Bangkok offer a glimpse at the traditional Thai way of life. Small wooden boats full of fruits and produce from nearby orchards and communities make a colorful and bustling scene at market time. The boats are usually paddled by Thai women and flat-topped conical hats, which are characteristic to all parts of Thailand. 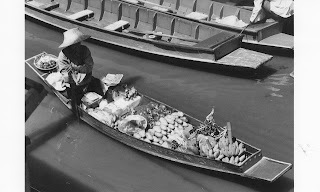 The floating markets are still important commercial centers for those living along the banks with no road access. Three floating markets are within reach of Bangkok: Damnoen Saduak Floating Market, Tha Kha Floating Market, Bang Khu Wiang Floating Market. A monk, dressed in an orange robe, passes in front of me. He waves over a small wooden boat and requests a sweet orange. He peels the fruit and eats it with a smile on his face. I can almost taste its sweetness by watching this peaceful man enjoy such a simple pleasure. As Buddhism teaches, by living a pure and simple life, one is able to gain extraordinary insight into the nature of things. The buzzing of Bangkok fades and I simply enjoy the charming scene. San Lorenzo Market- Florence, Italy: There are many street markets in Florence but the liveliest is San Lorenzo that stretches over a labyrinth of medieval streets that encircle San Lorenzo Basilica. You'll find leather goods, clothes, and souvenirs. As part of this market, you'll find the fruit and vegetable market in the nearby Piazza del Mercato Centrale. We wander the stalls of leather goods and I decide to try on a beautiful black calfskin jacket. It feels like butter. I rub my hands across it, coveting this gorgeous garment. My husband sees the look in my eyes and immediately makes it mine. To this day, whenever I wear my leather jacket I feel quite literally wrapped in the tenderness, warmth and affection of il mio vero amore! While markets can be a vulgar exhibition of physical and material commodities like Patpong, or an endless maze of savory aromas like the Grand Bazaar, a spiritual revelation like in Thailand, a warming and heartwarming experience like in Florence, a blast from the past like in Buenos Aires, or a traditional and commercial gathering like in Pisac...you never know what you will find. Have an open mind, a fat wallet, an affirmative ‘No Thanks’, and a love of the bargain hunt!